Parties and the release of this fantastic double CD will celebrate Radio Modern’s 10 year anniversary. More than 50 songs, ideal for anyone looking for the perfect soundtrack for an evening of swinging, bopping and rocking in forties, fifties and sixties style… in a Radio Modern atmosphere. Over the past 10 years, Radio Modern's many retro swing parties have carved out quite a reputation: great live bands, a Beauty Boudoir, dance lessons, whirling petticoats, amazingly dressed women and rockers and brimming dance floors. 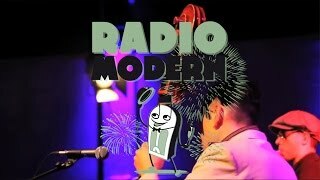 Radio Modern introduced the fifties to top festivals such as Pukkelpop, Lokerse Feesten, Dranouter, etc. and guaranteed sold out venues at the Roma in Antwerp or the Vooruit in Ghent. Very popular, trendy parties where trendy nightclub-goers happily share the dance-floor with older people who like to revisit their glory days. Nostalgic, unique and most of all old-school swing and rocking roots music! This release is only available on Double CD. Only a limited amount is left! EXTREME party music!